After we left J.M. Clayton Seafood and Captain Billy, our next destination was the Choptank Sweets Oyster Farm. Waiting to greet us and teach us how to grow and harvest oysters were Kevin and Bubba. I knew I was going to like Bubba when he started by passing around cold beers and shucking oysters that he'd just pulled out of the water. Bubba started our lesson by teaching us about the floating oyster beds - that they make - and are constantly working to innovate. There are hundreds and hundreds of these floating oyster beds and each needs to be flipped every two weeks to ensure the oysters get the proper ratio of sunlight and nourishment. That means that Bubba goes in and flips them. All of them. Which didn't sound so terrible on a gorgeous summer day, but consider winter when Bubba dons waders and an ice pick to get the job done. 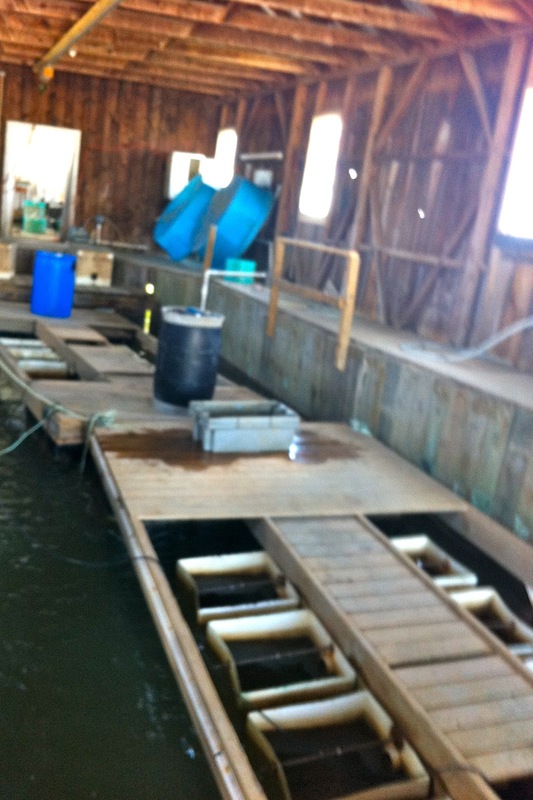 The baby oysters are raised under cover in this boat house. Just those two floats there have hundreds of millions of baby oysters getting bigger every day. When they are large enough, they are moved to the beds. Not to give bloggers a bad reputation, but after our early departure from DC and long drive to the Eastern Shore (plus stuffing ourselves with beer, crab and oysters), it was time for a break. I popped my trunk and unloaded a beach chair, towels and a tablecloth so that we could relax and catch some rays supervise the oyster farm. Ok, not all of us were lazing in the sun. Amanda had discovered that Bubba's dad was actually one of her teachers back in school. He'd now retired over to Cambridge and Bubba put him on the phone with her. With all of the touring and working done, it was time to say goodbye to Kevin and Bubba and go get some lunch. 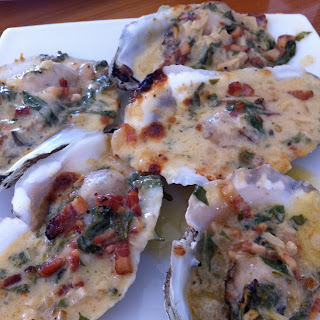 The guys recommended we hit Ocean Odyssey which served both beer and oysters sourced from Choptank Sweets. Blame college in Tallahassee, but I can't pass up a fried pickles so those headed to our table as well. I usually don't like the spears but these were perfecty cooked and still crispy on the outside. Next up, crab tots. Yes, that is what you think it is. 100% Maryland crab in tot form. Had to be done. And finally, Oysters "Bubba" Feller... yes, named after Bubba from Choptank Sweets and made with Choptank Sweets oysters. We died for these. And then Bubba walked in the door and we died a little more. I don't know if it was the day on the water or the oysters but at this point, we all had a bit of a crush on Bubba. Follow Choptank Oyster Company on Facebook to learn more and look for "Choptank Sweets" on menus. Or, just drive over to Cambridge and order some up at Ocean Odyssey (also on Facebook). This sounds like a dreamy day.